If you’re moving an aging parent into an assisted living community, research and best practices abound. There’s lots of smart advice about when it might be time for assisted living, how to choose a facility and finding new and improved memory care options, if your parent requires that type of care. But what happens if you need to move them from one assisted living community to another? It’s harder to find guidance about what to do in this situation. Maybe your mom, like mine, moved into a senior care home far from you but near where she’d lived for years because she didn't want to leave the area she knew. Understandable, right? But now circumstances have changed. She's not driving anymore, is seeing less of her community and wants to be closer to family. Or maybe management and services at your parent’s current facility have declined since his or her arrival. Or her health has changed, which requires a move. Or it’s the adult children who’ve decided that having Mom closer will be easier for them. Whatever the reason, it’s daunting to consider moving an older person from familiar surroundings to somewhere new, even under the best of circumstances and with the best of intentions. First you have to consider the risks. “The biggest risk is that your parent won’t like it,” says Amanda Lambert, an Aging Life Care professional, certified care manager and co-author of "Aging with Care: Your Guide to Hiring and Managing Caregivers at Home." “Even when a parent is initially amenable and there are clear benefits like being closer to the family, don’t underestimate the impact all-new staff, residents, surroundings and process will have on your parent. Comfort and familiarity count for so much. 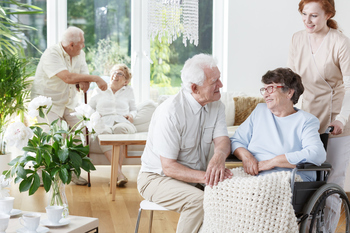 Particularly for an older person, any kind of move takes so much energy.” At best, your parent could be exhausted for days or weeks; at worst, she could face a cognitive setback. You’re not moving to a perfect place with perfect people. The food, décor, location, staff and residents could be disappointing, in any combination. If a move is inevitable, how can you mitigate the risks of the move? And you want to leave the light on for your parent returning down the road, just in case the move to a new community doesn’t work out like it should after a fair trial period. “The goal is to find a new place that’s as good or better than where your parent is now,” says Lambert. “Do as much research and visit as many facilities as you can so you know the options.” Especially if you’re planning a move to a new and unfamiliar location, consider using a local geriatric care manager who knows the options and is not tied to any specific facility. You’ll want someone who can do the leg work from afar. When it comes to a move like this, don’t go it alone. “It’s important to make sure that your entire family and any close friends are involved in the transition,” says Lambert. For example, siblings should get together and come up with a plan for visiting during the first month or so. Create and maintain a schedule so that your parent has help from loved ones while getting acclimated. You may need to provide extra handholding for a parent who has dementia or another cognitive impairment and either won't remember his decision to move or is intermittently conflicted. “Even with people who are confused, it’s important to acknowledge what’s happening,” says Cason. If your parent wants to move from one assisted living home to another, like in my mother’s case, then you’re empowering and supporting your parent in their decision. You can remind them of that if they start to question why they’re making a change. If it’s your or your family’s decision to move your parent, one way to know if you’ve made the right call is by asking yourself: Have I exhausted all other options that would spare my parent the difficulty of making a move? Mom needs to move in with me, but how do I proceed?